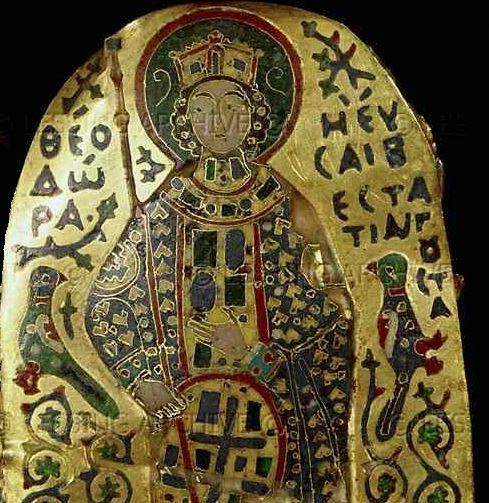 Theodora was a Byzantine Empress born into the Macedonian dynasty that had ruled the Byzantine Empire for almost two hundred years. She was co-empress with her sister Zoë for two months in 1042 and sole empress regnant from 11 January 1055 to 31 August 1056. Theodora became gravely ill with an intestinal disorder in late August 1056 and died a few days later, on 31 August 1056, aged 75 or 76. Having no children and being the last member of her dynasty, she had chosen one of her favorites, the former military finance minister, Michael VI Bringas, as her successor on the recommendation of her chief minister, Leo Paraspondylos. Hoping to recover her health, Theodora made her chosen successor swear that he would always obey her orders while she was alive. In the end he would not have to obey her long, for Theodora survived his nomination by only a few hours.